Nicoll’s “band of elegant tomboys”. Precise slits at the back of the ankle on a pair of grey cigarette trousers. As if Nicoll hit the refresh button on all his winning signature looks, taking his brand of ‘special normal’ towards a shiny future. Layered with sheers and an almost clinical sportiness. 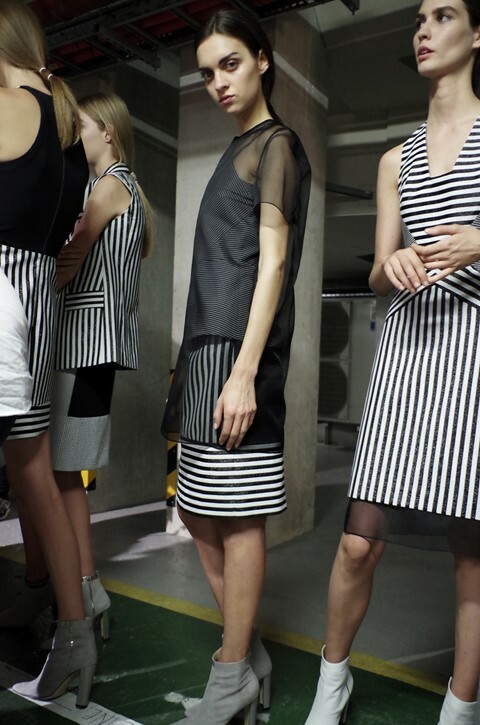 The graphic black and white striped dresses that turned out to be glittery Lurex up close. Linder lent her collage aesthetic to monochrome prints. An all-concrete basement loading bay at Regent’s University. “Do you have any signal?” Twitter went very quiet for 25 minutes. Lacquered in the same bubblegum pink shade that adorned the dresses and benches.